If you’ve mastered basic draw poker and the standard high hand rankings that govern the outcomes then why not try Lowball. This is a variant of poker in which normal hand rankings are reversed and it comprises a number of variants including California Lowball (ace to five), Kansas City Lowball (two to seven) and Ace To Six. Essentially a lower hand will beat a higher hand but of course different variants of the game have slightly different hand rankings as we shall explain below. A hand with no pair always beats a hand with a pair. One pair always beats two pairs and so on. 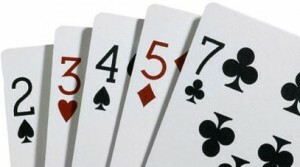 Hands with no pairs are compared according to the highest card; the highest card loses. If there’s a tie the low ‘kicker’ (lowest card) is compared. Aces are low and straights/flushes are ignored. Aces are low and straights/flushes do count which means that A, 2, 3, 4, 5 would lose, being a straight. Therefore the strongest hand is A, 2, 3, 4, 6. Straights/flushes do count which means that A, 2, 3, 4, 5 would lose, being a straight. Aces are high, and therefore the strongest hand is 2, 3, 4, 5, 7. Click the link at the top of the page to view all hand rankings.